FITCHBURG, MA -- The first golf article I ever wrote was called “Seeking a Cure for Bozoitis,” which basically detailed the story of a golfer trying desperately to avoid playing with the type of jerks who ruin everyone’s time on the golf course. These “bozos” lack the etiquette that makes golf enjoyable and though encountering them is rare, causes many players significant hesitation to be paired with strangers at any given time. Wouldn’t we be better off if everyone observed commonly held rules of etiquette? 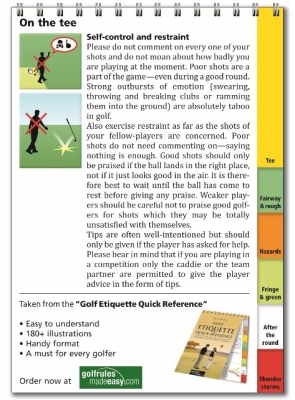 Thankfully, golf rules official Yves C. Ton-That has put together his Golf Etiquette Quick Reference Guide, intended to do just that. There have been a multitude of books and guides written on just about every conceivable subject in golf (Ton-That himself has written several on rules and interpretations), but try finding one that focuses only on etiquette. Being a 4-handicapper probably helps Ton-That understand the rules and etiquette at a high level. As a member of the editorial team of several leading golf magazines, he’s also demonstrated an ability to put those sometimes difficult concepts into words. The Etiquette Guide is an easy read – and entertaining as well. 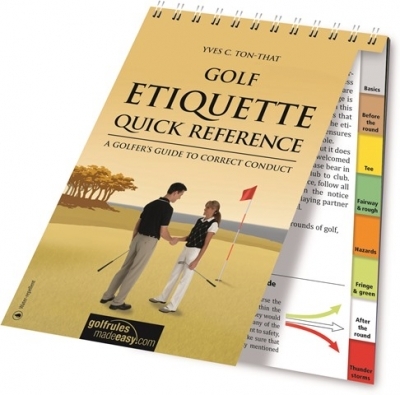 Q: Why did you write Golf Etiquette Quick Reference Guide? Ton-That: I decided to write a book about golf etiquette because it is a highly topical issue. I frequently hear complaints from club managers and presidents about the increasing neglect of the etiquette and also from golfers about rowdy fellow players and even violence on the course. Although etiquette has a long tradition and is just as important as the rules there is nearly no literature available about it. 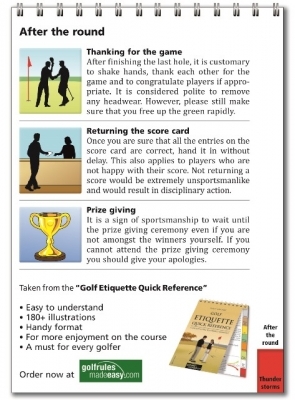 Even the official golf rules book contains 200 pages of rules (plus 500 pages of decisions concerning those rules), but only four pages about the etiquette. The first book I published was “Golf Rules & Etiquette Crystal Clear” which was very popular, but too large and unwieldy. For that reason, I created a compact guide about the golf rules (“Golf Rules Quick Reference”), which has sold more than 1 million copies and is the world’s best-selling golf book. 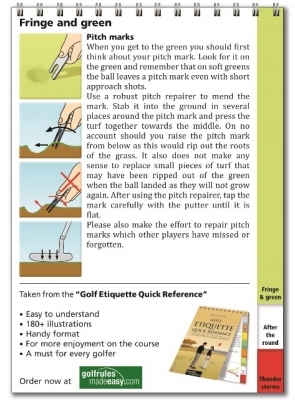 But it was missing the etiquette part and so adding the new compact guide “Golf Etiquette Quick Reference” was the logical sequence. Q: How has golf etiquette changed over the years? Ton-That: Golf experienced a real boom over the last 20 years and has become a very popular sport. Unfortunately, the side effect of this rapid growth was the unwritten laws of the etiquette could not be passed on adequately. Golfers show less respect for each other and neglect the protection and maintenance of the course. Q: Why is it important to create awareness of golf etiquette? Ton-That: I think it is important to create awareness of the importance of the etiquette and to help players understand it better. Treating other players fairly, safety, courtesy, taking care of the course and the ideal pace of play ensure that all golfers can enjoy their round as much as possible. Q: What is the importance of complying with golf etiquette? Ton-That: There is nothing more important in golf than complying with the etiquette. If you do, you will be a welcome guest and playing partner on any course – irrespective of your ability level. The best of results can never justify bad behavior. On the other hand, if you have a good etiquette -- even if you are having a very bad day -- you will still be a welcome playing partner. Ton-That is right – behavior does make a difference on the golf course. After all, if you’re going to be locked into spending four to five hours with anyone, you want to make sure it’s an enjoyable time. The Guide itself covers more than just who has the honor on every tee. It also deals with how to properly care for the golf course, which is a subject that desperately needs some attention. It should be common knowledge that ball marks on greens need to be fixed and bunkers raked… but how many times do we find it hasn’t been done? I was happy to find that I already knew most of what was in the book – so it was a good refresher course. But I also have several new golfers in the family and will make sure they review the rules – it will make it more fun for all of us. And in the end, Ton-That’s etiquette book may lead to the ultimate disappearance of obnoxious “bozos” on the golf course. Let’s hope so. The 48-page, spiral-bound and plastic-coated book is now available in good golf shops and at www.golfrulesmadeeasy.com for $12.95 (ISBN 978-3-909596-77-5, Artigo Publishing International, 1st edition 2014).